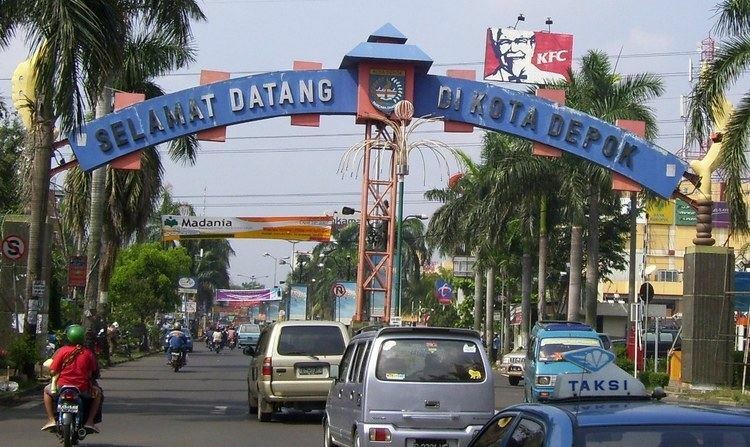 Depok (Sundanese: ᮓᮦᮕᮧᮊ᮪, Indonesian: Kota Depok) is a city in West Java province, Indonesia on the southern border of Jakarta SCR in the Jabodetabek metropolitan region. The "de" in Jabodetabek refers to Depok, while Depok word is an acronym of De Eerste Protestants Onderdaan Kerk (Indonesian: Organisasi Kristen Protestan Pertama, English: First Protestant Christian Organization). There is also a saying that the word "depok" itself comes from Sundanese language meaning hermitage or abode of one living in seclusion. It has an area of 200.29 km2 and at the 2014 Census had a population of 1,869,681 people, with a density of 8,746 people/km2. The city is divided into eleven districts (kecamatan). The seat of the regency is located at Depok Jaya. On 18 May 1696, a former VOC officer Cornelis Chastelein bought the land with an area of 12.44 km2, 6.2% the area of today's Depok. Besides cultivating the area with industrial plants with the help of the locals, Chastelein was active as a missionary, preaching Christianity to the indigenous Indonesians. To this end, he established a local congregation named De Eerste Protestante Organisatie van Christenen (DEPOC). Although the Sundanese name Depok, meaning hermitage or abode of one living in seclusion, was already in existence before the establishment of the congregation, some insist the acronym might have been the origin of the city's name. Today majority of Depok's population are adherent to Islam, except for the majority of the original Depok family. Before his death on June 28, 1714, Chastelein had written a will that freed the slave families of Depok and gave them pieces of his land, converting slaves into landlords. In 1714, the 12 slave families became landlords (forever as given to them with entitlement deeds of the owner Chastelien in his will) and freed men, women, and children. The freed slaves are also referred to as the Mardijker's - the word Merdeka meaning freedom in Bahasa Indonesia. June 28 is designated as Depokse Daag (Depok Day) by the original Depok family, and on June 28, 2014, 300 years of commemoration, they formally opened a 3-meter height monument on its own land, but it was prohibited by the Government as it referred to Dutch colonialization. The original slave families of Depok are of Balinese, Ambonese, Buginese, Sundanese and Portuguese Indo, i.e., Mestizo and Mardijker descent. Isakh, Jacob, Jonathans, Joseph, and Samuel were family names baptized by Chastelein after the slave families converted to Protestant Christianity. The other families retained their original names and might have been (Roman Catholic) Christian already before joining Chastelein's Protestant church. Descendants of the original Depok families with the exception of the Sadokh family, still live either in Indonesia or the Netherlands. In 1871, the colonial government gave Depok a special status allowing the area to form its own government and president. The ruling no longer stood after 1952, where the Depok presidency ceded its control of Depok to the Indonesian government except for a few areas. During the Bersiap (Indonesian civil war and war for independence from The Netherlands) period of 1945 much of Depok was destroyed and many of its inhabitants killed by 'Pemuda'. Many of the original Depok families fled for their lives from Indonesia during the Indonesian revolution and now live in the Netherlands as part of the Indo community there. In March 1982, Depok was reclassified as an administrative city within Bogor Regency and, in 1999, as a city headed by a mayor. 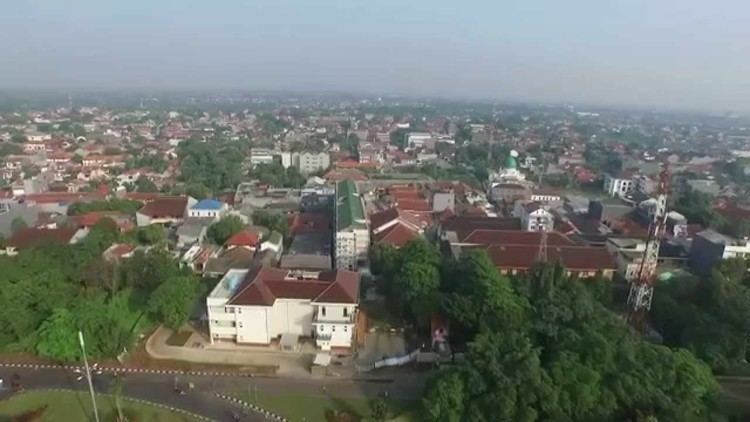 Then on 20 April 1999, the city of Depok was unified with some neighbouring districts of Bogor Regency to form an autonomous city of Depok (independent of the Regency) with an area of 200.29 km2. This date is commemorated as a date of the establishment of the city. Depok is divided into eleven districts (kecamatan), tabulated below with their 2010 Census population. Depok has a growing eclectic collection of malls and traditional markets. Older malls or other notable shopping centers include Mall Depok, Depok Plaza, and SixtyOne Building, and Depok ITC. Modern-day landmarks that were once known as Depok's primary shopping centers include Ramanda (now an autoshop plus education centre), Hero Supermarket (now Index Home Furnishings), Agung Shop (now defunct and burned during the riot), and Target (now defunct). Traditional markets include Pasar Depok Baru, Pasar Depok Lama (short: Pasar Lama), Pasar Kemiri (originally expanded to facilitate the move of Pasar Lama traders), Pasar PAL, Pasar Agung, Pasar Musi, Pasar Majapahit. Depok has several major bookstores including a Gramedia and Toko Gunung Agung and a large collection of small roadside bookstores. Depok has several private language schools, namely EF English First, International Language Programs (ILP), Lembaga Indonesia Amerika (LIA) and The British Institute (TBI),Lembaga Pendidikan Amerika Indonesia (LPIA) and several other smaller establishments. These are all along Margonda Raya and Cinere Raya, the main road through Depok. Public car transportation (angkot) is the major means of transportation in Depok.Depok is connected to Jakarta by KRL Jabodetabek commuter train, TransJakarta & Kopaja buses.